Recently, I have been nominated for 3 awards. I was nominated for the Liebster award by Ms. Tress over at http://misstress1.wordpress.com/ and Ashli over at http://aeferguson1019.wordpress.com/. 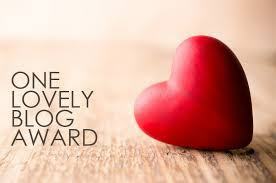 I was nominated by Laura over at http://20000milesandcounting.wordpress.com/ for the One lovely blog award. Thank y’all so much for the nominations. I am so honored and overjoyed. I am just ah smiling while typing this post 🙂 Since I have already done the Liebster award (click here), I will do the One Lovely blog award. I recommend that you check out their blogs if you haven’t already. You will definitely enjoy your time on there. 1. I’m 5’2 ½. My husband always laughs at me regarding the ½ because I always stress it lol. Yeah, I know I am a part of the short family. 2. I am a pk (preacher’s kid). The pressure that society puts on us can be a bit much at time but we are face with some of the same issues as others. 3. I am left handed. My husband is also but none of our kids are. 4. I use to play the piano when I was younger. I wish that I had kept playing. 5. I love music. Some music can be so soothing to me. I am able to lose myself in the beat. 7. I love to watch my kids interact with each other. I love to see their personalities in action. I hope y’all spread some love and check out all the wonderful sites. Have a great day in the blog world!!! Congratulations for your awards – well deserved – Congrats for those who nominated. I am kind of surprise. You welcome in reference congrats to you . I am still shock! the only hint I can share, revisit your list? That’s all!! Thanks sweetie, and I want to go to Ireland some day but im to afraid to get on a plane so theres always the possibility of going by sea take a cruise. That would be way more fun than an airplane anyway. You’re welcome Diane! I’m glad I’m not alone. Yeah, a cruise would be a great way to travel and get some fun in too. Congratulations! Thanks for sharing your journey! Congratulations JcCee! Thank you for the nomination. I am sorry for responding so late which was due to my traveling to the UK. May the Lord open His book of remembrance to you and yours in the name of Jesus Christ. May those that God has destined to help you never have rest until they have helped you in the name of Jesus Christ.